The Saw Shop want you to be able have your blades and tools reliably sharpened at sensible prices. No matter if it is a domestic blade or an industrial blade, we want to give you a high quality service. Kitchen tools, garden tools, woodworking and metalworking tools, engineering tools, printer's guillotines and tree surgery tools can all be sharpened to a high degree of precision. Check our sharpening prices. 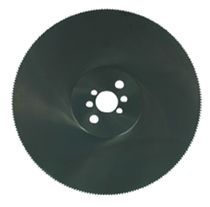 HSS saw blades are for cutting all types of ferrous & non-ferrous metals. These blades come HSS steam treated, or TiN coated.